From the outset, I have always had a keen eye and passion for military history. 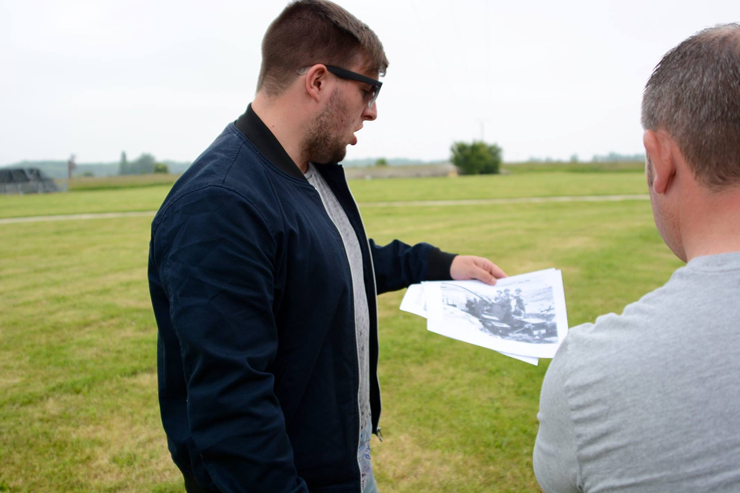 This passion blossomed when at around the age of 13 my parents sacrificed the annual family holiday for a battlefield tour with Legers to the ‘D-Day landings in Normandy’. As the years went by, passion turned into devotion and alike so many others I am now dedicated to telling, revealing and researching the stories of men who participated in the wars for the purpose of commemoration and remembrance. Paying my respects to Kenneth Swingler. 102 LAA. 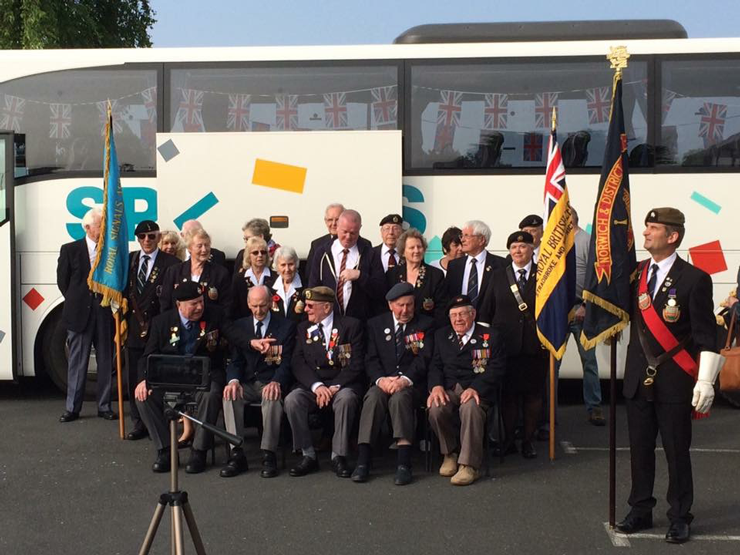 The pilgrimage to Normandy this year marked the 72nd anniversary of the D-Day landings. From the initial stages of planning the trip of which began late last year, we were aware that this year would be a very special journey and I am still finding it difficult to process what I have witnessed over those very special few days. 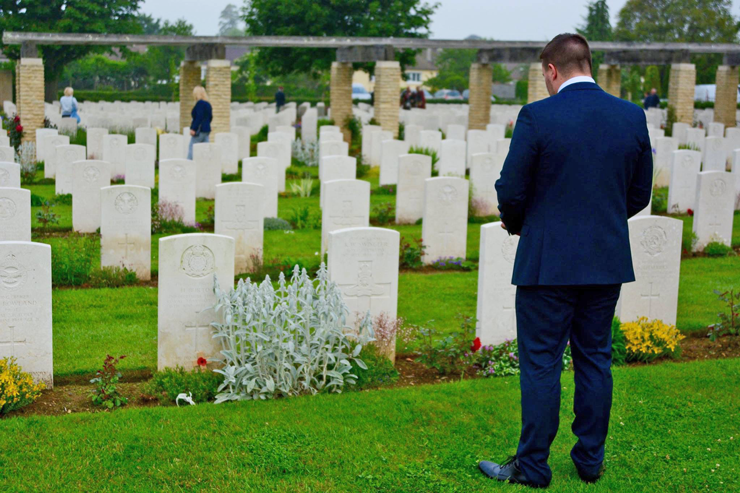 For the purpose of this write up I have chosen to narrow down the five day trip into three poignant parts of my personal choice; the ‘Merville Battery walk’, personal research in Normandy and lastly the experience with the veterans. I think the name ‘Merville Battery walk’ has been unofficially settled by those who took part in it and by those who have heard about it (although I have also heard it called the ‘crazy 1 am walk’). 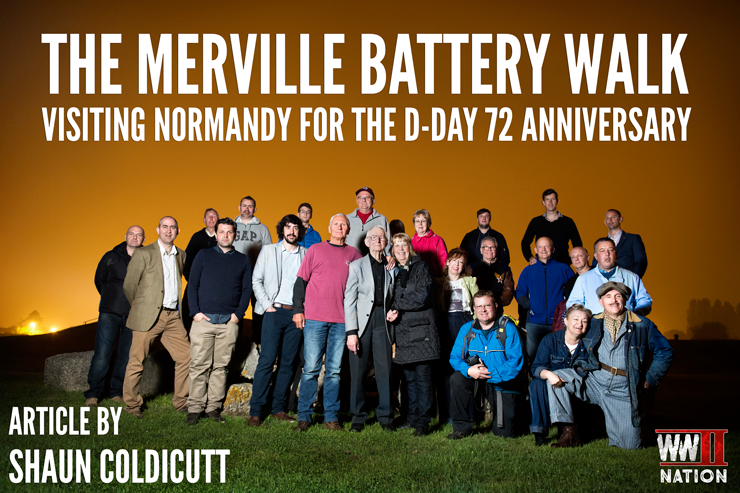 It all began on a trip to Normandy last year, when three of us (Ben Gilbert and Joshua Finzi) had this idea of standing around the area of the Merville battery/DZ V/DZ N at around 1 am. Personally, this idea was purely as a personal service to remember those men who risked everything and for my interest in the attack on the case-mates. I had this belief that standing there in the darkness imagining the sky filled with parachutists would be the best and most poignant minute’s silence I had to offer. Unfortunately, with the long days and lack of planning this never happened last year. 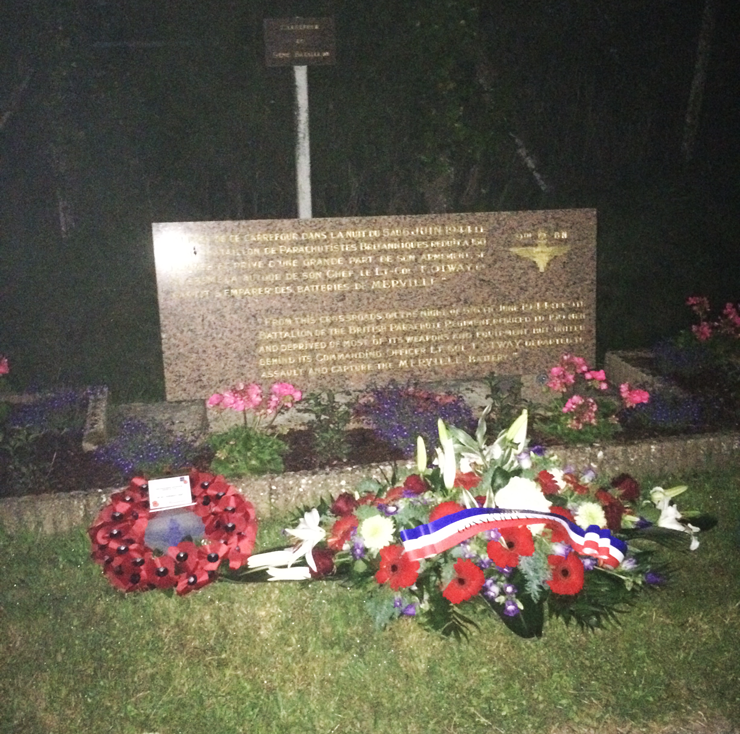 After talking about it to Ben Mayne, we decided that we would place it in this trip’s itinerary and that it would fit in appropriately after the service at Pegasus Bridge at 00:16. 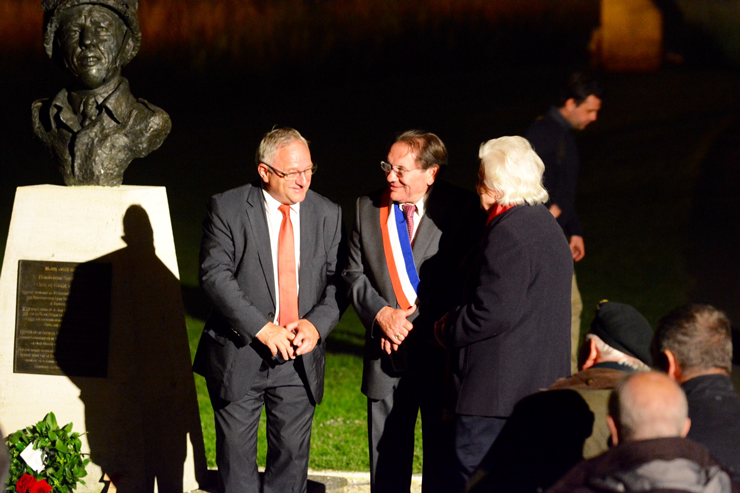 After a few months, we thought to ask Mark Otway, the Grandson of Lt Col Terence Otway who commanded the attack on the Merville battery. Mark agreed enthusiastically and shortly after we also had Neil Barber (Author, The Day the Devils Dropped In) joining us, although with his expertise and knowledge on the subject, leading us! This was getting quite exciting and escalating far from the original plan. 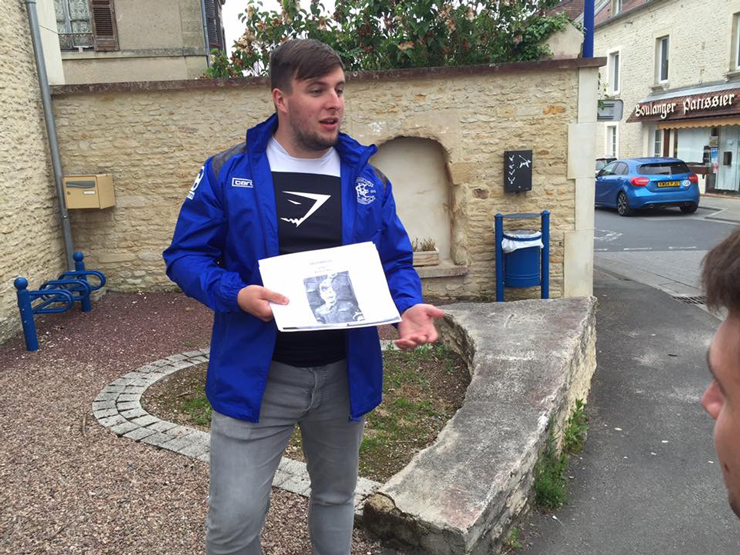 Finally, Robin Savage (D‑Day ‑ The Last of the Liberators) was to join us with his interests in the Normandy campaign and not to mention his excellent photography skills. As the trip approached, planning went into the walk. We had decided to meet at Gonneville-en-Auge (formerly Gonneville-sur-Merville) and take the same route as the significantly smaller force 72 years previous. For this part I must thank Neil and Ben for their collective planning. 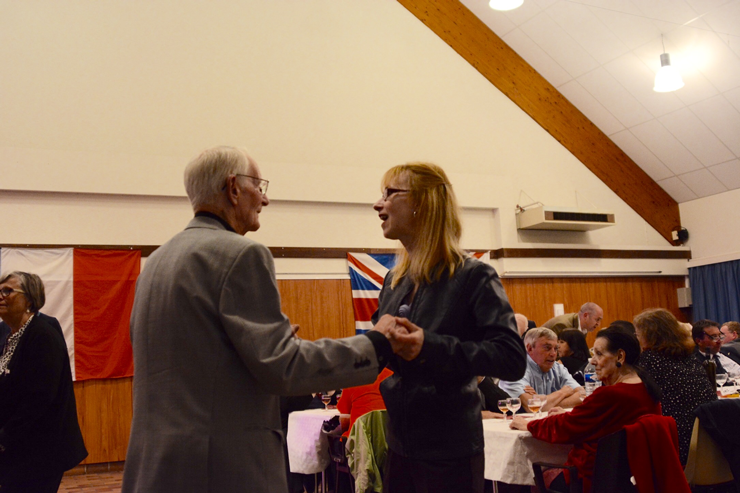 On the 5th June, we attended the 9th Parachute Battalion meal in Merville-Franceville-Plage. It was here that Mark revealed to us that 9th battalion veteran Fred Glover was interested in joining the walk. This was incredible news. Fred was apart of the Coup-de-Main glider attack on the battery and was significantly wounded. Fred danced all night at the meal. After the service at the canal, we headed to Gonneville and waited for the others. Shortly after 1 am I believe we numbered some twenty plus. Immediately it was easy to appreciate the conditions and difficulty of the tasks that lay ahead for the men. The darkness and the noise were big factors. Although we were a seventh of what attacked the battery, I somehow think that our noise on the road would have certainly alerted the enemy as it was very difficult to keep quiet. Also, the sense of being alone in amongst the enemy must have been terrifying. During the walk up the lane towards the battery, it was easy to appreciate how the darkness must have been your own worst enemy as everything looked as though it was a person; however Fred and the girls kept our spirits high with some singing. 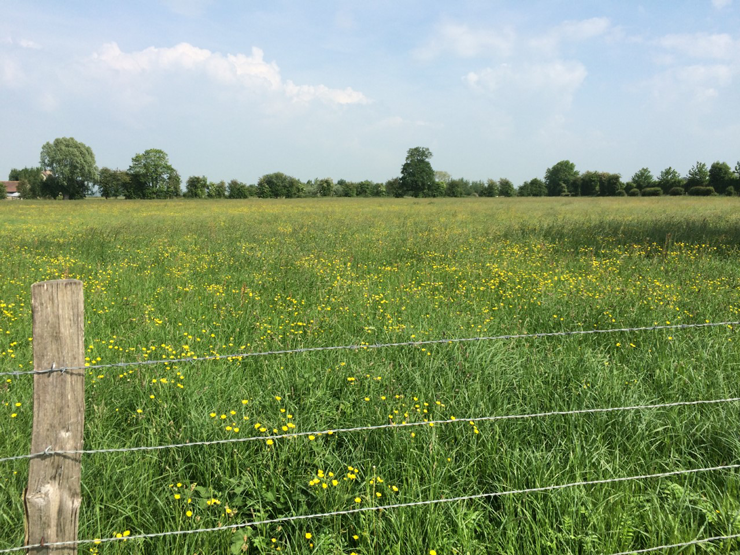 The minefield where 9th Parachute Battalion made their assault on the Merville Battery. As the battery loomed into view, each person on the walk had their own personal ideas of the task that lay ahead for the men of 9th battalion. Personally for me, the daunting concrete giants standing out against an eerily dark background played a big factor in my appreciation for what the men had to contend with. 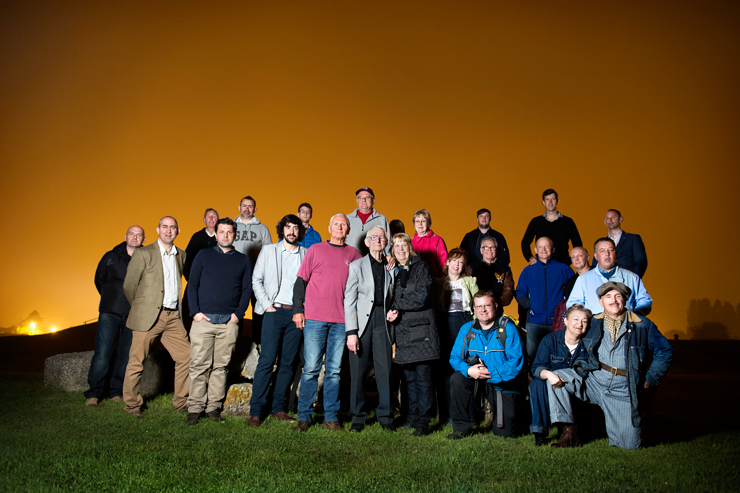 Fortunately for us we entered the battery unopposed where we set up for a very special photograph, orchestrated by the excellent Robin Savage. 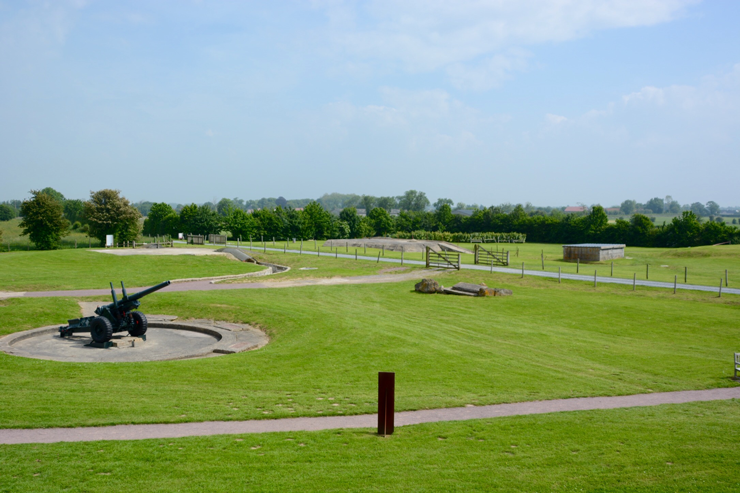 The Merville battery walk was an experience we will never forget. We always talked about how this might progress, so who knows what is in store for the future! In October 2015, I commenced the research of John William Lance, father of an old teacher and friend, Peter Lance. Peter mentioned in passing that his dad landed in Normandy and I pressed home how important I felt it was that he let me conduct some research into John’s past to commemorate him. Peter knew nothing of his service career as similar to so many other veterans John did not talk about the war. A long but very enjoyable, satisfying and exciting seven months later and fortunately we have a detailed history of John’s life during the war accompanied by some remarkable never before seen wartime photographs of him in Wilhelmshaven, Germany. John joined the Royal Artillery in November 1939 and was posted straight into a light anti aircraft (LAA) regiment and saw action during the Battle of Britain, Normandy, Holland and Germany. John also met his future wife during the war whilst being sent to various training regiments in Anglesey. In 1943, John was posted to 102 LAA of which he would remain with throughout the war and in particular; Normandy. Sailing from the Tilbury docks, part of 102 LAA including John’s 338 battery landed on Sword beach on the 16th June. 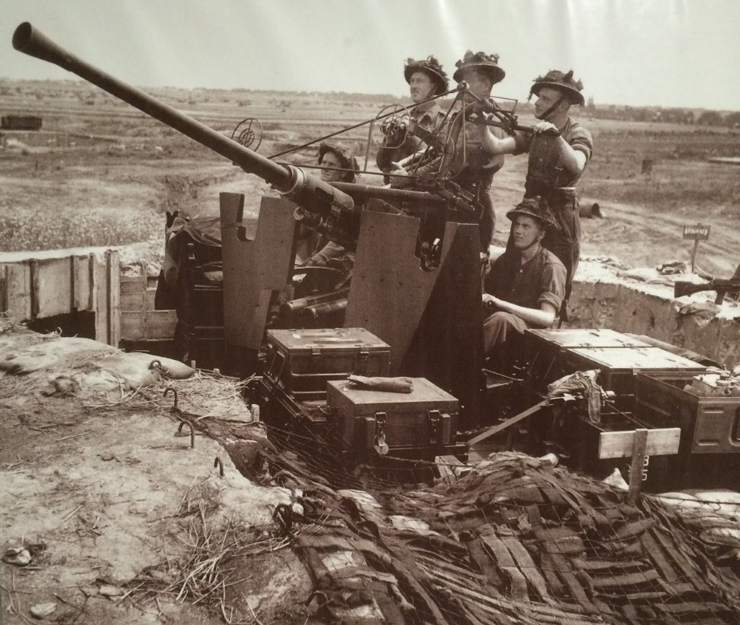 The battery was given the task of protecting 3rd Div HQ in both an anti aircraft and anti tank role. John’s time in Normandy was unfortunately cut short when after only five days on the 21st June he was wounded. In his personal diary he writes ‘Hit, church tower. Sniper’ and for many months (previous to knowing what part of the army he served in or when he landed) I believed this to be true. However after researching where the battery was positioned we have concluded that the likelihood is enemy shell fire. I have always stated to his family that I would not disagree with John as anything is possible in war. 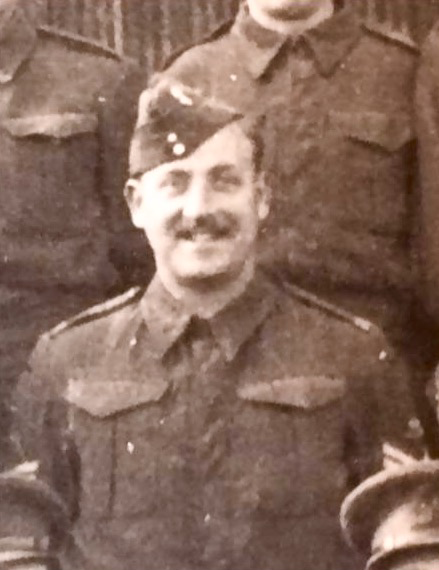 After being sent to 176 field ambulance, John would pass many of his comrades and future battery members when he was moved on to 88 general hospital which was located at Douvres la Delivrande. Douvres also housed a radar station of which his future battery, 336 battery, 102 LAA set up positions after landing on Juno beach. 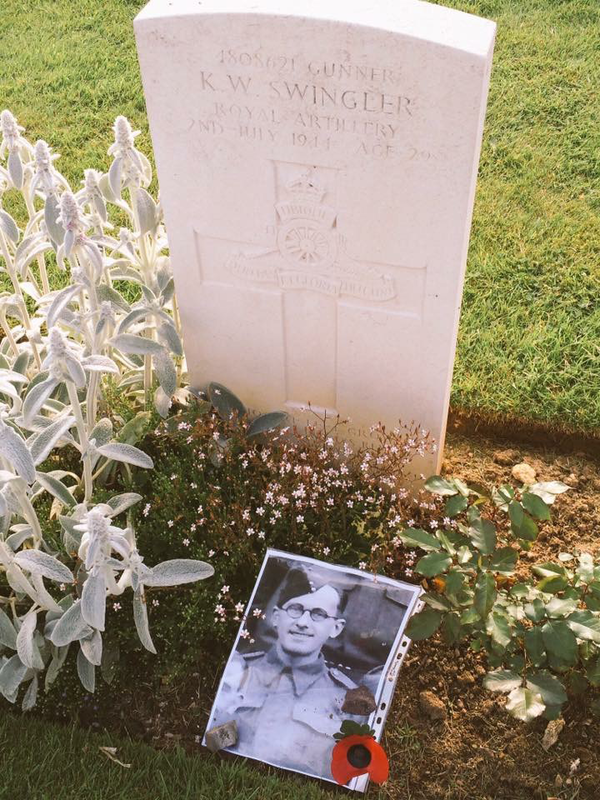 A week after John was wounded significantly enough to be sent home, Kenneth Swingler, 102 LAA was killed after a shell scored a direct hit on the troop’s headquarters. Sadly, the only mention Kenneth receives in the regimental war diaries is the lesson that should be observed is not to place a dugout on the enemy side of a wall. Kenneth is buried at Ranville war cemetery. It was very moving for me to go to these sites, take in what I have known and read over the last seven months and explain to those on the trip what happened to John, Kenneth and the regiment. A sad but true representation of the Normandy campaign is that such a great deal happened in such short time frames and as such it was great to uncover perhaps some private stories that may not have ever been heard or told before. This final section I would like to pay tribute to the veterans and to those in particular at our hotel during our stay for D-Day 72. 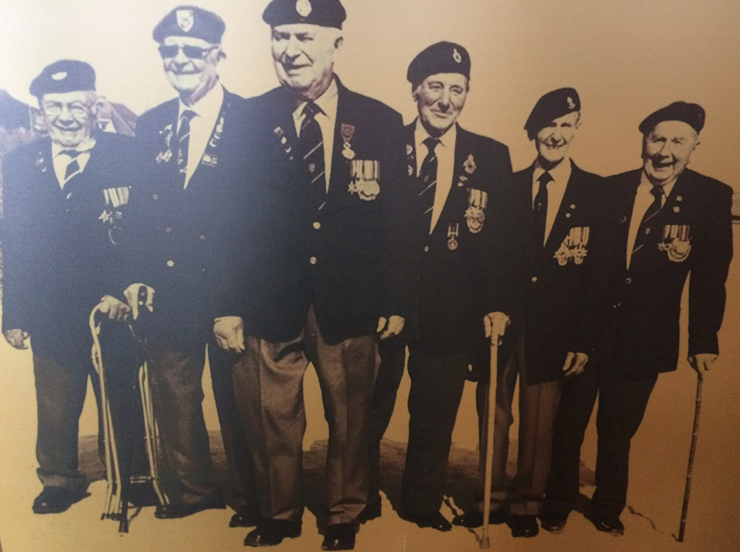 To Neville Howell, Alan King, David Woodrow and the other Norwich and District veterans and their families who ventured with them, thank you for your time and patience with us each night and morning. These men would often go to bed, after very long and tiring days yet still muster the energy to beat us to breakfast. I vividly remember the first night, sitting at dinner listening to an excellent singer provide war time classics to the veterans when Neville walked up to our table, placed his arms around us and said ‘Can I ask, what are you doing here?’, the rest is history and each night we would come back to the hotel, sit and listen to their incredible, individual stories. 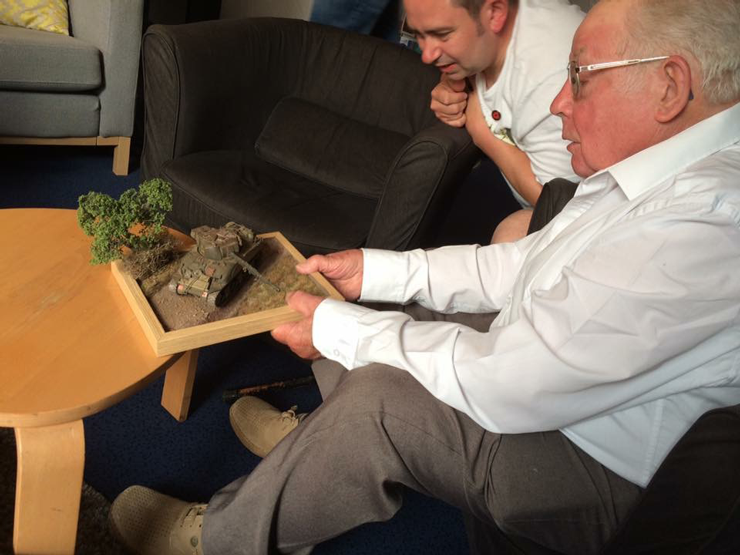 It was a great pleasure presenting Alan King (East Riding Yeomanry) with an excellent model of a Sherman firefly created by Ben Gilbert who unfortunately could not be there to present it himself. These men were prime examples of the greatest generation, very humble and very modest gentlemen to whom we owe everything. 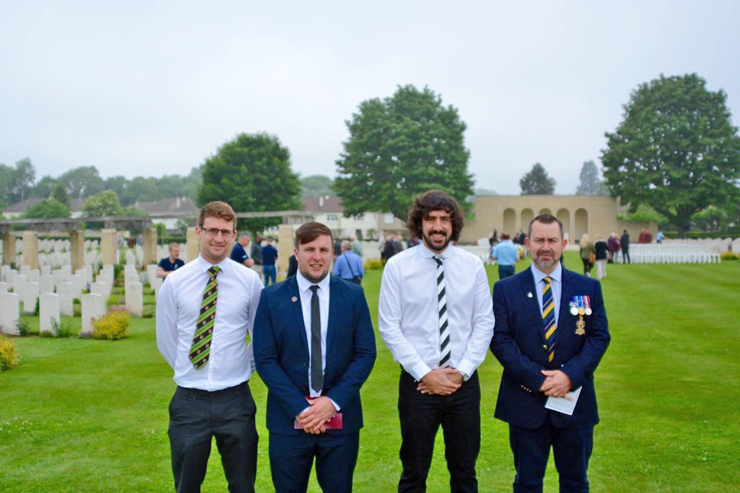 Thank you to Shaun for sharing with us his pilgrimage to Normandy for the 72nd Anniversary of D-Day. 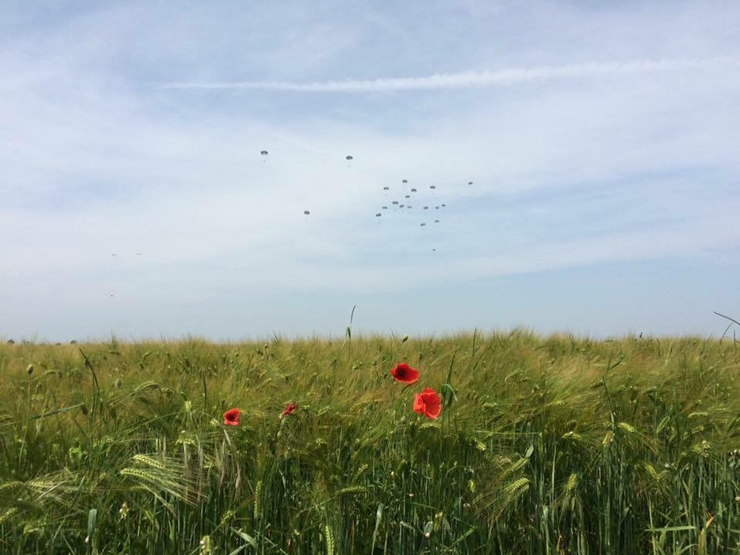 As I am sure you will agree, it must have been a remarkable experience and tribute walking the route to the Merville Battery with veteran Fred Glover. You can find out more about Shaun and the research he has done on John Lance by following him on Twitter : @ShaunColdicutt. Photo Credits: All photos were kindly taken and provided by Shaun, Ben Mayne and professional photographer Robin Savage.